As I mentioned in previous posts I am not typically a “Brand” guy but as a rare exception I’m becoming a fan of the Vortex Optics brand. This morning over coffee I was scanning the Vortex Optic site for 2016 products when I happened across the All About Optics Brochure. I found it to be nicely done and informative in a down to earth manner. Being a curious guy I decided to research who wrote it. It appears the author is CPL. Reginald J.G. Wales a technical field advisor for Vortex Optics. Upon further research it turns out CPL. Reginald J.G. 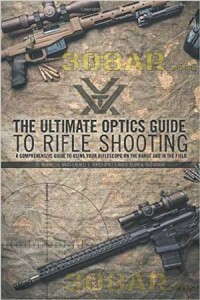 Wales is also the author of a book from Vortex optics called “The Ultimate Optics Guide to Rifle Shooting” from Vortex Optics”. The Ultimate Optics Guide to Rifle Shooting was released in December 2015 and has no reviews at the usual places. The book can be previewed on Google Books and purchased from Google and Amazon in Hardback, Paper and Kindle versions. I was hoping the kindle version would be less expensive but it’s the same as the paperback. I ordered the paperback. Look for feedback and a review in the near future. The The Ultimate Optics Guide to Rifle Shooting is a comprehensive manual that teaches you everything you need to know to use your optical scope to its maximum potential. Although showing you how to use your scope to hit the target is the author’s top priority, he also teaches you how to use your scope for other tasks, such as zeroing in at different ranges and using your reticle to calculate range, measure objects at a distance, adjust for wind and elevation, measure unknown bullet drop, and much more.Packed with illustrations and equations and loaded with practical exercises that help you apply what you learn, this book will raise your shooting skills to a whole new level. Whether you are a competition shooter, a hunter, or a law enforcement or military professional, this book is an invaluable addition to your marksmanship toolbox. The author, Cpl. Reginald J. G. Wales (CAF, Ret.) serves as a certified firearms instructor and also a technical field advisor for Vortex Optics (Canada). In this book, he draws on experience in the military and as a firearms instructor, a hunter, and competition shooter to teach you how to get the most out of your scope on the range, on the hunt, and on the battlefield.